"This is one of the most delicious, addictive things I've ever tasted, and it takes about 5 minutes to make! It doesn't have a traditional dressing consistency (it's more like a dip,) but it is great on salads and with raw snack veggies! The best part is that it is rather strong, so a little goes a much longer way than other dressings!" Combine maple almond butter, maple syrup, seasoned rice vinegar, sesame oil, and salt in a jar or container with a tight-fitting lid. Cover jar and shake until smooth. 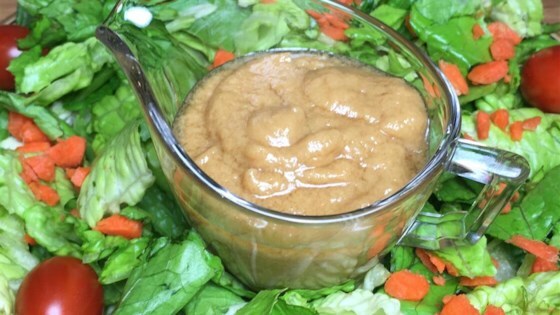 You may have to stir the dressing if the almond butter is cold. This version is high in sugar, but you can also make it with 1 tablespoon maple syrup. I used Justin's Maple Almond Butter®, Whole Foods® 365 (Organic) Grade A Maple Syrup, Nakanos® Original Seasoned Rice Vinegar, and International Collection® Toasted Sesame Oil. I really like the taste of this, but it is entirely too thick to be called a dressing. I think it needs to be much thinner for a lettuce salad, but it's perfect for dipping fruit or veggies.